You might describe dense pack cellulose insulation as a more intense version of the loose-fill cellulose that’s often blown into unfinished attics. The material is the same. 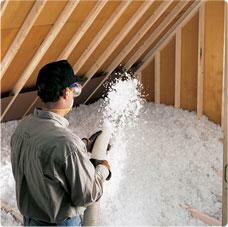 What distinguishes the two types of cellulose insulation is the installation technique. Cellulose insulation is made from recycled newspaper that’s treated to resist mold and fire. When loose-fill cellulose is blown into an attic, a blower unit outside the house shreds the insulation and then blows the fluffy material at low pressure through a flexible hose. A technician in the attic directs the application to ensure thorough, even coverage. Contact us today for a Free Estimate for blown insulation in Canton, Akron, Cleveland, Hudson, Cuyahoga Falls, Ravenna, Bedford, North Royalton, Westlake, North Olmsted, Wooster, Painesville, Alliance, Kent, North Canton, Beachwood, Barberton, Willoughby, Gates Mills, Stow, Brunswick, Massillon, Elyria, Lorain, Strongsville, Lakewood, Chagrin Falls, Medina and all surrounding Ohio areas. In a dense-pack installation, cellulose is injected into enclosed building cavities (usually stud bays in wood-framed walls) through access holes drilled from inside or outside the house. This energy-saving retrofit can be done whether the walls contain fiberglass batt insulation or no insulation at all. Even if the walls are already insulated with fiberglass batts, the dense-pack installation will do a much better job of filling gaps, limiting air leaks and providing even, overall insulation performance. More air pressure is required to inject cellulose into wall cavities. At the beginning of a single wall cavity injection, this higher air pressure causes minute cellulose particles to blow out through gaps around electrical outlets and other air leakage points. But these leaks are soon plugged by the pressurized application, and the cavity begins to fill. When no more cellulose can be injected into the cavity, the technician moves on to the next stud bay. Access holes are plugged once the overall installation is complete. Dense-pack cellulose provides about R-3.8 per in. of insulation value. It’s a cost-effective way to upgrade walls that are wasting energy and compromising interior comfort because of inadequate insulation. 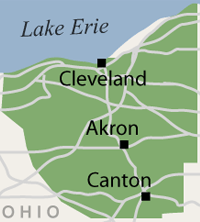 Contact us today to schedule a Free Estimate for wall insulation in Ohio including Canton, Akron, Cleveland, Massillon, Elyria, Lorain, Strongsville, Lakewood, Chagrin Falls, Medina, Hudson, Cuyahoga Falls, Ravenna, Bedford, North Royalton, Westlake, North Olmsted, Wooster, Painesville, Alliance, Kent, North Canton, Beachwood, Barberton, Willoughby, Gates Mills, Stow, Brunswick and the surrounding area. Contact Us Today for Cavity Wall Insulation! We are your resource for blown insulation in walls to help improve your home’s energy efficiency and comfort! We are a proud member and installer of Nu-Wool® cellulose insulation.